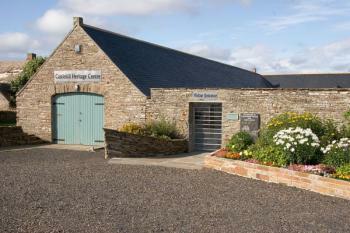 Castlehill Heritage Centre is run by Castletown Heritage Society. Over the years Castletown Heritage has amassed a significant collection of local artefacts reflecting the archaeological, social, commercial and industrial heritage of our parish, ranging from single pieces to lifetime collections by local people - from fossils to photographs, matchboxes to mangles. A key aim of the Society is the conservation of all such relevant material through careful cataloguing and appropriate storage. open throughout the winter, every Wednesday, Saturday and Sunday afternoon from 2pm to 4pm. An evening talk revealing the fascinating story of Frances Purves (1829 - 1900) from Thurdistoft Farm. On Saturday, 1st September 2018 we are having a brooch making day with Joanne Kaar teaching techniques etc. There are still a few places so if you wish to take part phone 01847 821 120 which is the Centre. Castletown Heritage Centre, Harbour Road, Castletown. Saturday 21st November 2015..
Castletown Heritage Centre, Harbour Road, Castletown Tuesday 24th November 2015 - 7.30pm..
Castletown Heritage Centre, Harbour road, Castletown. Every Wednesday, Saturday, Sunday - 2.00pm - 4.00pm..
Saturday 15th August Join Melissa and Romain of the School of Ancient Crafts as we explore how plants and herbs were used in the past. This workshop will include a spot of foraging as well as making soap with native herbs, using pot-boilers (hot stones) to heat milk and make a soft cheese, baking bread next to an open fire, and much more! Join us again on Sunday 16th August to learn how to build a prehistoric oven in which we will bake fish and bread. Castlehill lies just outside Castletown, Caithness. The area was once famous for its flagstone industry and the nearby harbour is evidence of that. Wed, Sat, Sun 2 - 4pm All Year Winter exhibition - Domestic Artefacts Over Time – Looking at the change in technology in the home as the years have gone by. Marine Exhibition – Models of ships that carried flagstone from Castlehill, marine charts, artefacts from marine life.